As part of our 100th anniversary celebrations, this Friday, June 3rd, NRC will donate the historic first colour-standardized Canadian national flag to the Canada Science and Technology Museum. His Excellency the Right Honourable David Johnston, Governor General of Canada, will deliver remarks and honour six NRC alumni for their outstanding research over the past 100 years. You are invited to watch the ceremony live via webcast at 2:30 p.m. ET. ** In order to minimize technical difficulties, we encourage people to gather together in common meeting rooms. Note: employees participating at the Centennial festivities during work hours may use code D206-100TH to capture their time in Sigma. Dans le cadre des célébrations entourant notre centenaire, ce vendredi 3 juin, le CNRC remettra au Musée des sciences et de la technologie un cadeau à caractère historique : le premier drapeau national canadien à appliquer des normes de couleur internationals. Son Excellence, le très honorable David Johnston, gouverneur général du Canada, prononcera une allocution et rendra hommage à six anciens du CNRC pour leurs remarquables travaux de recherche au cours des 100 dernières années. Nous vous invitons à être témoins du déroulement de la cérémonie diffusée en direct par webdiffusion à 14 h 30 HE. ** Afin de réduire les difficultés techniques au minimum, nous vous prions de vous réunir dans des salles de réunion pour l’écouter en groupes. Remarque : Les employés qui participent aux festivités du Centenaire pendant les heures de travail peuvent utiliser le code Sigma suivant : D206-100TH. Heraldic roots in Leeds & Grenville have everlasting results!!! In June of 1946, a British Gentleman arrived in Brockville Ontario, Leeds County to begin his new job as the Manager of the Royal Bank of Canada. His name was George M. Beley. Mr. Beley and his wife Irene soon became entrenched in the social life of Brockville. When Mr. Beley was not at work or involved in a social event he was buried in research. His research was also his passion, the study of heraldry. For most of us we do not know much about the study of heraldry, so a brief description may be in order. Heraldry dates back to the 13th century and includes the study of crests, coats of arms, flags, and honours (awards) to list a few of the interests of heraldry. In 1948 a young, wounded WW2 Veteran and Lawyer arrived in Brockville in Leeds County to set up his Law practice, his name was John Ross Matheson. Mr. Matheson and his wife Edith soon became entrenched in the social life of Brockville. When Mr. Matheson was not working in his Law office or attending social events with his wife Edith he was buried in research. His research was his passion of heraldry. Very soon John Ross Matheson (a Liberal) and George M. Beley (a staunch Conservative) were the best of friends and together were entrenched in the study of heraldry. Over the next 20 years these 2 men became known by the Heraldic Authority in England and Scotland as highly respected experts in this field of study and worked on some very interesting and productive heraldic projects. One of those projects was to acquire the City of Brockville official Grant of Arms and Flag in 1966. After years of working to acquire their personal “arms” they felt it was time to have a truly Canadian Heraldic Society. In 1961 John Ross Matheson was elected as the Liberal Member of Parliament for Leeds County (now Leeds & Grenville). In July of 1961 in one of the first meetings with Lester B. Pearson leader of the Liberal Party of Canada, he was asked by Mr. Pearson to begin researching what it would take to bring a National Flag of Canada to fruition when the Liberal Party formed Government in the future. This request was made by Mr. Pearson on that day because he had been informed of John Ross Matheson’s work in the study of heraldry, arms, crests and flags. From this point on Mr. Matheson was recognized as the Liberal Party of Canada’s Parliamentary Flag expert. The next 3 ½ years proved to be a very productive time for Mr. Matheson’s heraldic endeavours in Parliament and his continual collaboration with his dear friend George Beley. This long-time friendship and heraldic research is the basis of how our Canadian Maple Leaf Flag was brought to fruition in 1964/65 and this is why Leeds & Grenville is the “Birthplace of the Canadian Flag”. From 1948 until 1966 these 2 amazing Brockville Citizens worked to promote all things heraldic, this was an 18 year work of commitment and passion. And let it not be forgotten that John Ross Matheson was instrumental in the creation and design of Canada’s highest honour “The Order of Canada” a historic Canadian symbol which is also recognized and respected through-out the entire world. Leeds & Grenville has so much history to be proud of and these 2 men and their accomplishments should be promoted and honoured by each and every citizen of our community. As a point of interest, one of the first individuals living in Canada to be heraldically “Granted Arms” from England was General (later Sir) Isaac Brock. The following is a comprehensive account of the historical facts surrounding the Birth of Canada’s Flag. What began as a search for identity in, a yet to be Sovereign Country in 1860, some “Canadians” believed that the Maple leaf was the one and only symbol which would provide instantaneous recognition around the world. Some 98 years after confederation, Canada’s Parliament finally completed the erroneous and sometimes very divisive task of providing our country with its very own National Flag. 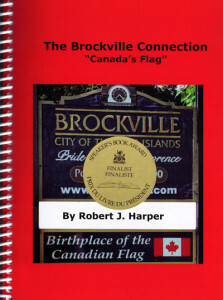 As a Canadian I am so very proud to have been able to write this factual account of “Who” and “How” our beloved Canadian Maple Leaf Flag was brought to fruition in 1964/65. I feel blessed to have known the honourable John Ross Matheson and able to tell the entire world he was my friend. 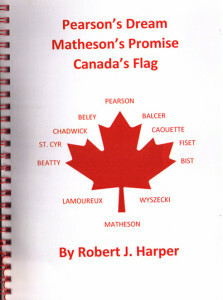 I hope all Canadians will have the opportunity to read this account of the history of the most recognized symbol of Canada in the world and appreciate the work of the many caring hands who helped to bring a positive result to Pearson’s Dream and Matheson’s Promise. The complete video (includes the two start points on other posts). On Canada Day 2014 Brockville flew the new 70ft x 35ft Canadian Flag weighing 125lbs from the new 160ft flag pole on the 401 at Smart Centre on Parkedale and North Augusta roads. There was a spectacular turn out and their were many speakers including Mayor David Henderson. John Ross Matheson (father of the flag) signs a Canadian Flag with the help Robert Harper the Executive Director of the Canadian Flag Education centre. The Flag-mobile promotes our mission to educate people across the country about the history of the Canadian Red & White Maple Leaf Flag, its origin, its birthplace and it’s father. Copyright © 2013– All Rights Reserved.